Here we have a silhouette of the Wellington Monument in the Blackdown Hills near Wellington, Somerset. I had just dropped my son off at school in Tiverton and was heading back home, and, as the evening was sunny (certainly way more than I had seen for much of the day!) I decided to take a small detour to take a look – I was rather hoping for some spectacular views across the Somerset and Devon countryside, but the trees around the monument have now grown too tall to be able to see anything – mind you, the monument is still quite impressive. 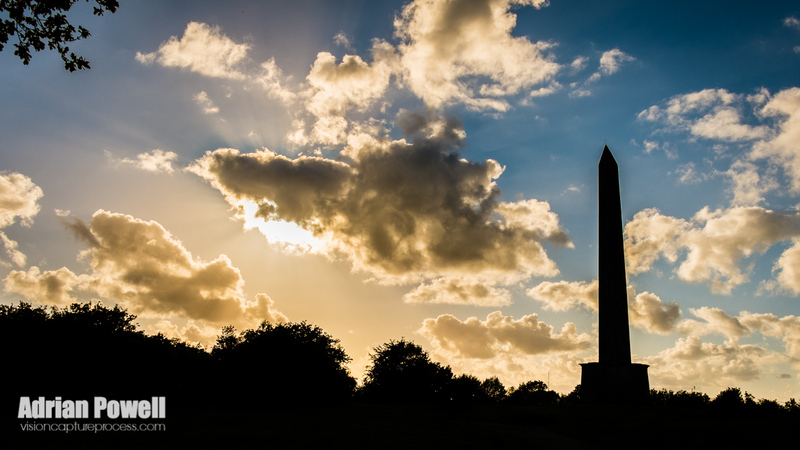 The monument itself has had quite a history – originally, it was to be some 29m high with a cast iron statue of the Duke of Wellington to commemorate Wellington’s victory at Waterloo. However, the money ran out soon after it started in 1816…it was finally finished in the 1820’s, but more as the obelisk that we see today, far from the original design (somewhat similar to Nelson’s Column in Trafalgar Square in London) – repairs were done after lightning strikes, with the final work being completed at the end of the 19th Century. When we see this monument from the motorway, I always tell my children (and grandchildren) that the monument was erected to mark my birth in the cottage hospital in Wellington, now over 70 years ago. Of course they don’t believe a word of it once they reach the age of five! Nice picture. Hope you are well? Chris – funny, there was no mention of you on the National Trust sign! 😉 I didn’t realise that you were originally from Wellington – it’s a nice part of the world!